Sep 5 2017 - Jamil is living on the bank of the Brahmaputra, a fisherman, carrying out his ancestral fishing business over the years. As a breadwinning person in the family, he has to feed several mouths. Moreover, Jamil is deeply rooted in his land. Jamil is in dismay, thinking that his business is no longer like back then when he used to travel to the bottom of Brahmaputra with his father by troller to catch fish. Jamil has a favourite flash back. They came back with baskets filled with fishes, and his father nodding his head told the tale of the daunted local sailor whose heroism melted Jamil’s heart, and he wanted to play with the jewel blue stream of the Brahmaputra like this sailor. However, after reaching home, their happiness flourished more to join dining as they found the delicious fish curries on the table. Life changes its colour. Recurrent floods and booming industrial growth are grabbing up the lands and shirking his fishing business. However, this time the flood is devastating than they ever have experience. Their lands swamped up, and people started starving. Surprisingly, although relief workers supplied flood, still they spent time with empty bellies because they had no cooking arrangement. Jamil and his people are gripped by fear and uncertainty. They do not want to lose the sacred connection with their land and people. It would be a scary ride for them if their land would become uninhabitable and they would be forced to live in another place. Staying apart from ancestral occupation is a peril not only for fear of losing livelihood and being unemployed but also for getting separated from the age-old cultural heritage. Cultural heritage gives people like Jamil the meaning of life and for them losing land means the loss of their identity. Northern part of Bangladesh has been facing the aftershock of massive food attack for a couple of months. Embracing human rights based approach is imperative to address the sufferings of the flood affected inhabitants to offer them a dignified them. While the climate change is already understood as an economic and environmental problem, the tendency to view this phenomenon through the lens of human rights implications has been little. Recently the trend has changed. For instance, the Paris Agreement, an hard-fought achievement, begun speaking the language of human rights in the context of climate change. In December 2015 this agreement took a big leap through the prioritising of human rights, and provided the commitment of encouraging the people centred approach to combat climate change. The heart breaking story of Mr. Jamil indicated that the climate change impacts magnify the sufferings of local people by making their land uninhabitable and even putting their lives in danger. This write up will unpack the integral relationship between climate change and human rights and how this relationship evolves over the years. The association between climate change and human rights law is a grey area of international law. In 2005 when attacking the United States’ environmental policy, the Inuit with the support of the Center for International Environmental Law (CIEL) and Earth Justice placed a petition before the Inter-American Commission on Human Rights (IACHR). The petition argued that the antipathic environmental policy of the United States is the leading cause of the vast range of human rights infringements of the Arctic communities. Although the claim was rejected, it ignited consciousness within concerned bodies of the need to evaluate the connection between climate change and human rights. On the other hand, although the steeply rising green-house gas emissions (GHS) are responsible for the less habitable conditions of states with vulnerable ecosystems, it is a complex task to assess how a single polluter contributes to the plights of certain populations. However, the Inuit petition is a compelling step toward making liable high emitters such as the US and China for climate change effects around the world. However, despite the law related complexities, respect to humanity embedded in a broad spectrum of human rights principles echo the regional friendships and moral values of nationsacross the globe. For instance, Australia as a high emitter state takes the burden of its affected neighbouring countries to assist them in strengthening culture resilience and, when the land of these neighbours turn uninhabitable, they will take steps to ensure their orderly migration. As an early stage of this process, Australia has launched a Kiribati Nursing Initiative (KALI) allowing young Kiribati citizens to study nursing at Australia’s tertiary institutions. The islands of Kiribati, which are at the risk of disappearance, through this nursing scheme can ensure their inhabitants get access to the skilled migration programme of Australia and other countries. Rather than imposing ‘one-size-fits-all’ model, this policy introduced by Australia thus tailors the schemes to the need of the individual community. Hence, States nourishing the good neighbourhood principle can reduce the psychological vulnerabilities of their closest neighbours arising from their climate change contribution. 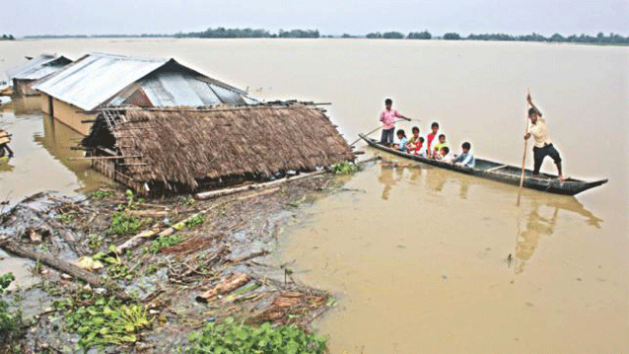 Bangladesh is already in the survival threat due to the excessive emissions of industrial States, and the ramifications we are incurring now in the form of a recent flood attack. I wonder during this turmoil, would Bangladesh be ambitions if it expects support from its neighbouring States? The writer is Casual Research Assistant at Newcastle Law School, University of Newcastle, Australia.